Welcome pocket knife fans to my review of the Spyderco Delica 4. Let me start by saying I’m a huge fan of Spyderco knives, and have owned just about every one of their production EDC knives at one time or another. In fact, one of my very first EDC knives was a Spyderco Delica 1 and I have been keeping an eye on the advances in the knife’s design ever since. Sure enough, it’s an excellent knife, with only a few minor flaws. Spyderco is based in Golden, Colorado, and has been one of the leader’s in the knife industry since 1981, when founder Sal Glesser came out with Spyderco’s first folding knife, the C01 Worker. The Delica line is one of their most popular product lines, and also one of their oldest product lines, first appearing in 1990. 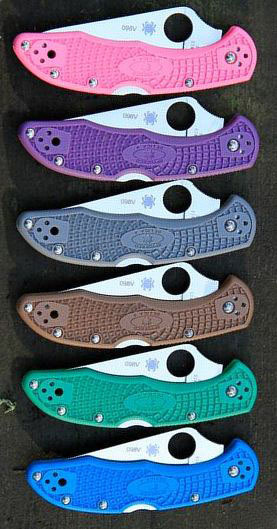 The Delica 4 is now available with either a plain edge or a partially serrated combo edge, with seven different handle colors. An excellent EDC with a few flaws but overall a top notch performer for the money. The blade of the Delica 4 is made from the honorable VG-10 steel, which is super rust resistant and sharpens pretty easily. VG-10 steel is Japanese steel, originally designed by Takefu Special Steel. This type of steel was originally marketed towards Japanese chefs, but knife-makers quickly noticed the steel’s usefulness in pocket knife blades. VG-10 stainless steel is made up of the usual suspects – iron, carbon, chromium, molybdenum, vanadium, cobalt, and manganese. Again, it can be real sharp but also a little brittle so beware. Spyderco is a large consumer of VG-10 steel, but I notice their competitor SOG also utilizes VG-10 for many of their higher end folding knives. This is a full flat-grind drop point blade, which makes it very nice for slicing and dicing just about anything you can imagine, from cardboard or thick plastic to fruits and vegetables. On some models the blade is coated with titanium carbon nitride, to give the blade its tactical black appearance. Right out of the box, my Delica 4 was razor-sharp, and it’s relatively easy to keep it that way – especially with my Spyderco Sharpmaker sharpening system. Spyderco has their trademark “spyder hole” thumbhole (0.5” diam), which I find is much easier for one-handed opening than a thumb stud. The Delica 4’s handle is made of fiberglass-reinforced nylon (FRN) with skeletonized stainless steel liners. The blade is perfectly centered inside the handle, with no erratic gaps between the blade and the liner. Still, the blade does not rub against the liners at all, but opens smoothly and easily. The FRN scales feature bidirectional texturing for a solid grip along your entire hand, and the jimping on the back and bottom of the handle are perfectly suited to heavy usage. There is a bit of a choil on the bottom of the blade, but it does not have any jimping, so I would not recommend using the choil as a finger grip for anything but the lightest of knife work. The mid-lock back locking mechanism functions flawlessly and mine had no up-and-down play as some have reported. 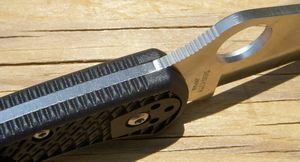 This type of locking mechanism keeps the handle thinner than a liner lock, but is just as effective in keeping the knife locked in the open position. I have gotten used to liner locks, and thought the mid-lock lock back would throw me for a loop, but I found it to be easy to get used to. Best of all, though, the knife does not have any horizontal play at all, and the blade is perfectly centered between the scales and liners. The body and blade of the Spyderco Delica 4 are now held together with Torx screws, so you can disassemble the knife for cleaning if you need to. Of course, every knife has its Achilles’ heel (or heels), and even though the Delica 4 is an excellent knife, it still has its weaknesses. First, the optional black coating on the knife blade is scratched easily; so do not expect that tactical black finish to last forever. I’ve even seen keys scratch off the coating; it’s much like the anodized black coating on Apple’s iPhone 5, so expect some wear. The steel itself, though, will not be damaged. Overall it’s not something I worry too much about. While the VG-10 steel is easy to moderate to sharpen, I found the blade does not hold its edge as well as other types of stainless steel. I find myself sharpening my Delica after about 2 weeks of daily usage. Fortunately for the knife, I find sharpening my knives to be a source of relaxation, so I enjoy the procedure! I use 100 grit and 400 grit whetstones for my Spyderco Delica 4, and get an edge on the blade sharp enough to easily trim small strips of paper. I read a few reviews saying that if you are exerting a lot of force on the knife, you may notice some vertical play while the blade is open. I can report that I did not experience this. Even so, I very much doubt it’s enough to slip past the locking mechanism, so if it happens to you it will be more of an annoyance than a safety issue. Finally, the pocket clip could be designed a bit better. The Delica 4 rides a little high in the pocket, and there have been reports of the clip breaking easily. Thankfully, I have not yet seen the clip break on mine, but I do wish the knife rode a bit deeper in my pocket. Overall, the Spyderco Delica 4 is a fantastic working knife, and I am proud to have it in my EDC collection. While I rotate through my EDC knife collection monthly, and sometimes weekly, the Delica 4 has a favored spot in the collection and probably goes in my pocket more often than any of the other knives I carry. It is also a very high quality EDC knife with a fairly low price point, and the multiple handle colors allow buyers to have some choice in customized appearance of their EDC knife.